We use the GentleYAG laser to treat blue veins on the face, primarily around the eyes. It is the only laser of its kind patented and FDA cleared for vein removal. The long wavelength of the GentleYag laser reaches deeper into the skin, making it ideal for treating veins. Before | After: The patient received one GentleYAG treatment to blue veins on her temple. The FDA has cleared the GentleYAG laser to safely reduce the appearence of blue veins. It has an excellent safety profile. Like any surgical or non-surgical procedure, there are risks. As a teacher and trainer of other physicians in laser procedures, Dr. Cox stresses the importance of finding an experienced physician who understands the finer points of laser treatment. There is no downtime associated with GentleYAG blue vein treatment. Pinkness or redness of the treated areas is typical immediately after treatment. Mild swelling may be present for a few days after treatment, but this quickly resolves completely. 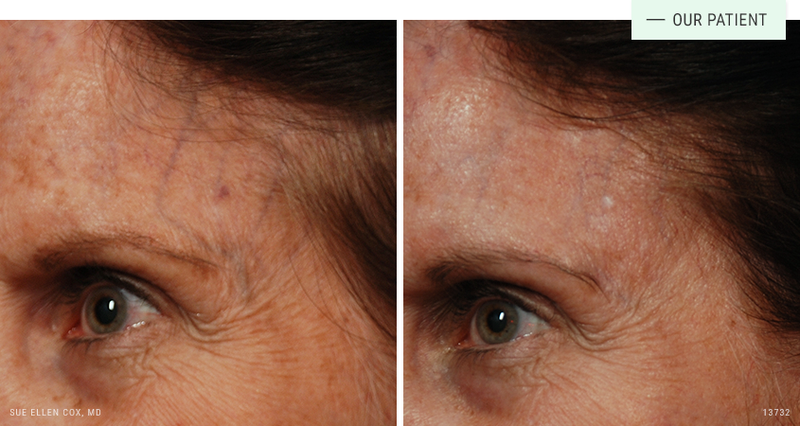 GentleYAG blue vein treatment is often focused on the face, but may be used on other areas of the body. It is possible to treat multiple areas of the skin in a single session. GentleYAG reduces the appearence of blue veins as well as venous lakes. Patients are typically happy with results from one to three treatments.